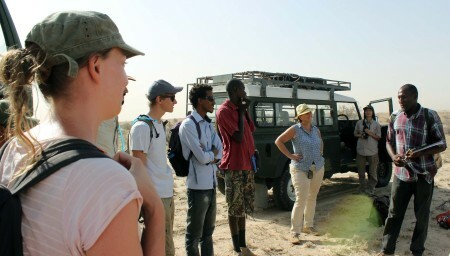 We made it across to the west side of Lake Turkana on March 6th. 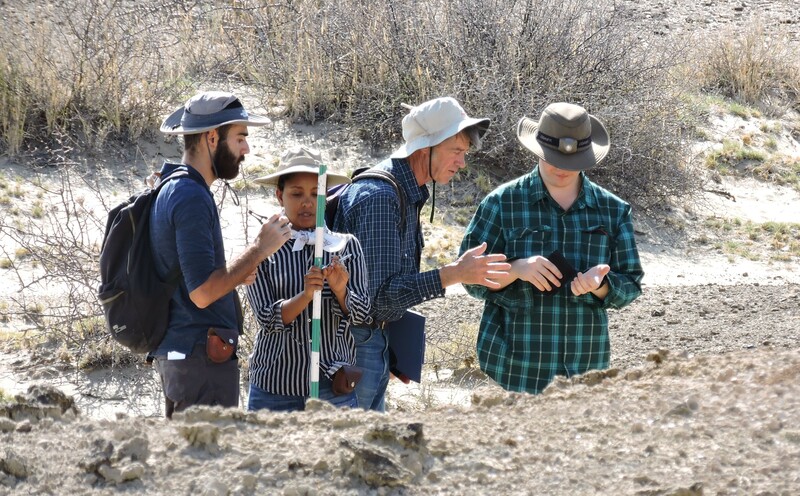 Having learned about the ecology, paleontology and geology of the basin from an east side perspective, we were excited to learn about what the west side has to offer. 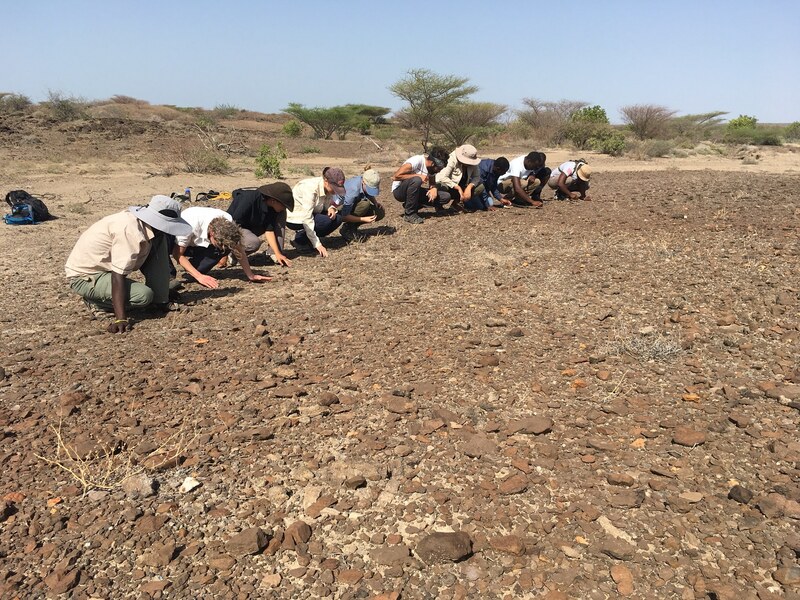 Many important paleoanthropological and archaeological discoveries were made in areas on the west side of Lake Turkana. The TBI Turkwel facilities are situated in a prime location for reaching many of these sites. 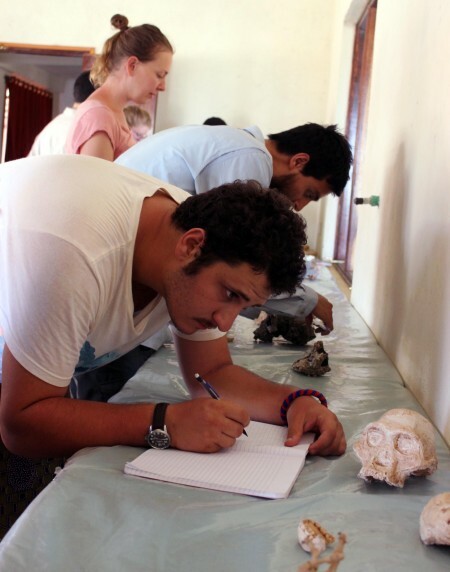 We will end our time in the TBI Origins field school with our last two modules: Paleoanthropology and Archaeology. TBI students were fortunate to hear the human evolution story, told through the experience and expertise of Dr. Marta Mirazon Lahr. Dr. Mirazon Lahr is one of the leading experts in the field of human evolution, conducting research in a wide breadth of topics including morphological evolution in the genus Homo, human evolutionary dispersals, evolutionary genetics and adaptation in hunter-gatherers, the formation of population boundaries, and the evolution of diversity in hominin technology. 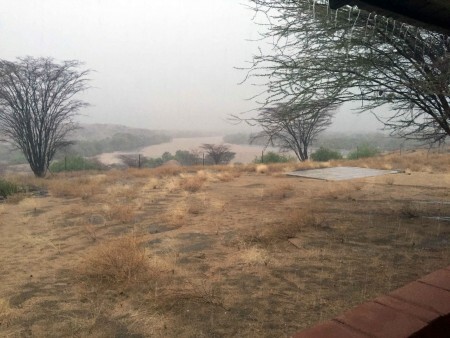 The heavy rains drenched TBI Turkwel camp for two days, making many of the routes to farther sites difficult to traverse. You never know what might happen out in the field and we encountered a minor setback during the human evolution module. The heavy rains came for two days in the first week of the module, preventing us from safely driving to the field sites we had planned to visit for our overnight camping trip. We did enjoy the refreshing rains and wind that brought a brief relief of cooler temperatures. 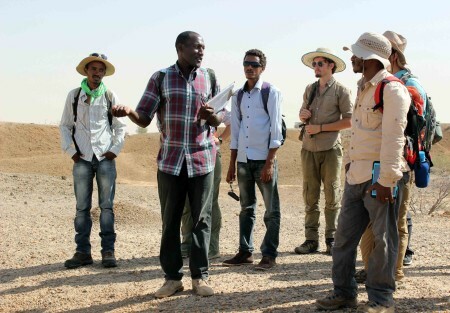 We made the best of our situation, filling course time with laboratory activities and short trips to early hominin sites close to TBI Turkwel. When we find an ancient primate fossil, how do we know whether it is part of the human ancestral lineage? The truth is that it’s a long and complicated process, and sometimes we never figure it out. 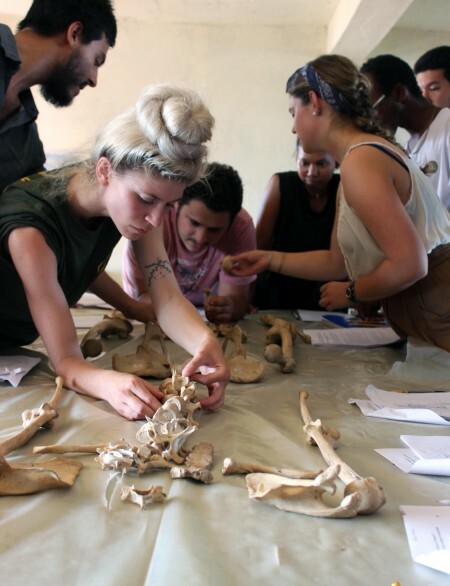 After finding out the age of the fossil, a good starting point is to gain an understanding of comparative modern human and non-human primate anatomy. This provides us with anatomical features that range on a spectrum from more human to more nonhuman primate. Since we have a better understanding about anatomical parts and their function in living species, we can extrapolate this information to extinct species for informed ideas about how they lived and moved. Dr. Frances Rivera and Dr. Mirazon Lahr gave the TBI students a quick introduction to human anatomy in the lab using replica human skeletons. It always helps to learn a complex subject with a hands-on approach. 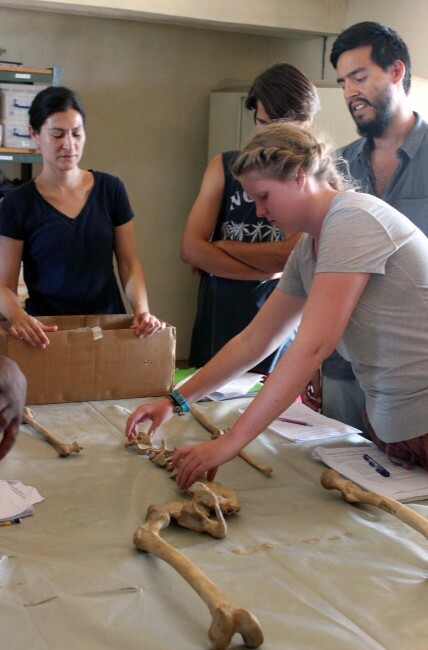 Dr. Frances Rivera helps students piece together a replica human skeleton in a human anatomy orientation. 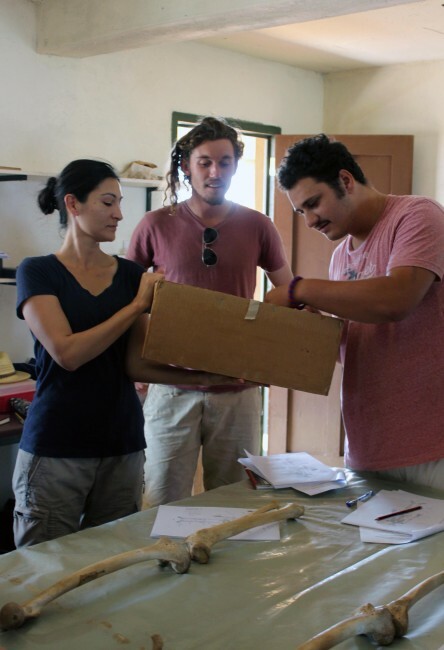 Dr. Rivera, Jamie and Max sort through a box of replica skeletal bits to piece together the human skeleton. 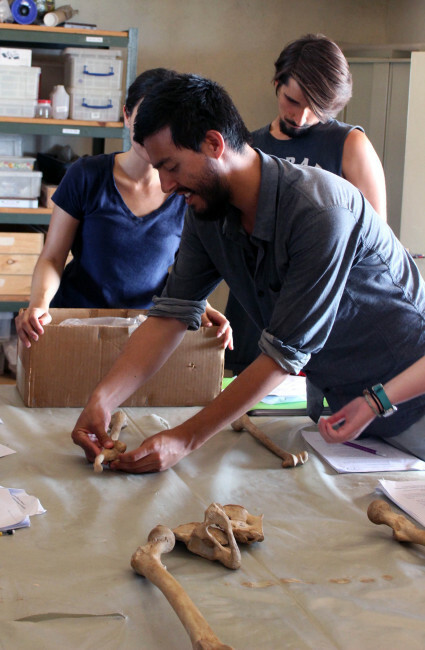 Dr. Rivera presented the class with a box full of replica human bones and asked the students to lay them out on the table in anatomical position. 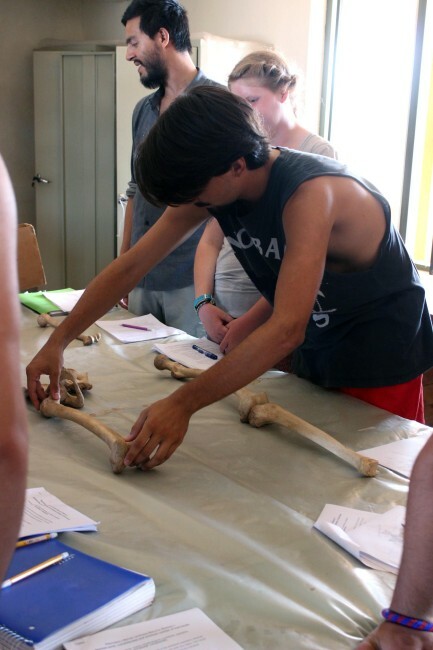 Armed with a workbook on human skeletal anatomy (and some help from certain students with a bit of anatomy background), the students pieced together the skeleton. 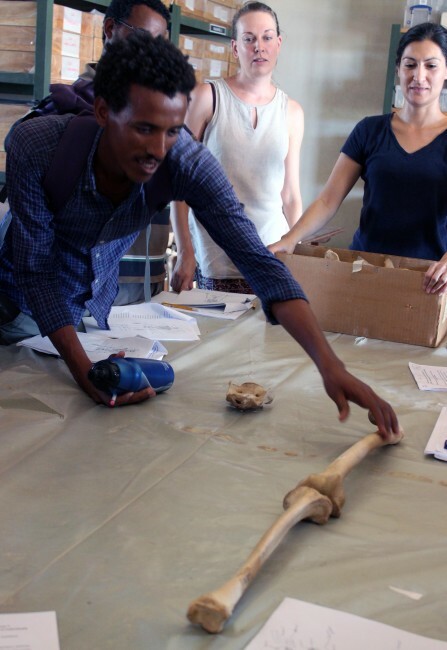 Yemane uses some of his expertise to show students the placement of phalangeal bones in human fingers. Kait works on placement of the vertebrae to construct a full spinal column, while Max, Ryan and Jen work on the lower limbs. Jen demonstrates the placement of the clavicle bone. Evan works on some long bone placement. Maddie adjusts the placement of the vertebrae . Niguss works on lower limb placement. 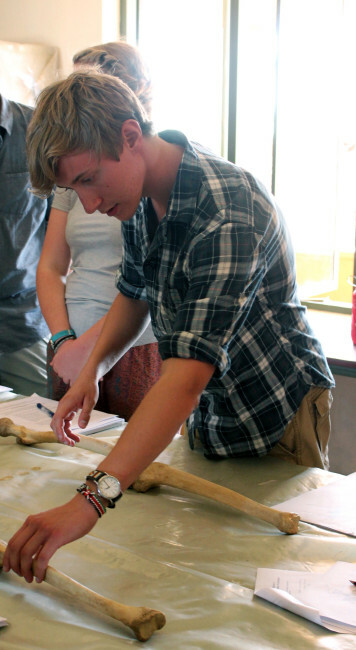 Rob tries his hand at piecing together the human skeleton. Ryan works on upper limb bone placement. It took a team effort to put this skeleton together. Knowledge of skeletal anatomy is useful when trying to understand the shapes of bones in relation to their function and position in the body. When we compare the skeletons of extinct species to what we know about extant skeletons, we can see how they are similar and different and what that might mean about their function in the past (e.g., is the pelvis shaped so that the individual walked on all fours or on two legs?). The fossil record of our human ancestors tells a long and complicated story. The origins started somewhere between 6 to 7 million years ago in Africa. Hominins are primates just like species of Pan, Gorilla, and Pongo. However, hominins are distinguishable from these other groups in two key anatomical features: smaller canine teeth, and skeletons that facilitate bipedal locomotion (walking on two legs). These features might indicate changes in diet, more dependence on tool use, efficient terrestrial mobility and even new systems of heating and cooling the body. Fossils finds of the earliest hominins are rare because they are difficult to preserve over such a vast amount of time. 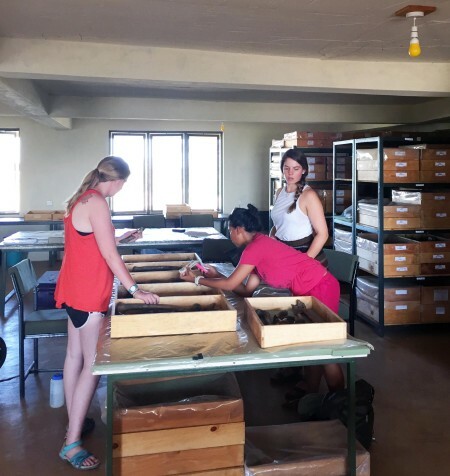 However, we have several specimens that point to about 5 early hominin species (that we know of for now…). 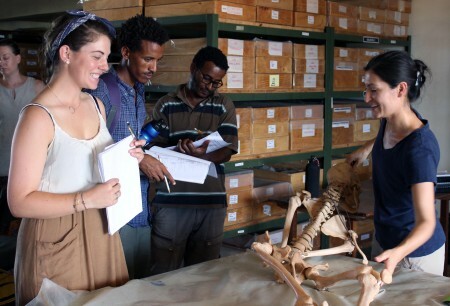 Sahelanthropus tchadensis, Orrorin tugenensis, Ardipithecus ramidus, Australopithecus anamensis, and Australopithecus afarensis all display bone morphology that suggests bipedal locomotion – but with different degrees of certainty. The bipedal locomotion that these species had was much different from that of our own, or even of later hominins. Anatomical evidence suggests that these species’ bipedal locomotion was less efficient, and that they maintained the ability to move around in trees better than fully bipedal hominins (like us) can. Overall, the evolution of bipedalism is important as it is likely related to increased movement on the ground (instead of in the trees), increased aridity in the surrounding environment (more open landscapes to traverse) and for thermoregulation (cooling down larger brains and bodies that may be moving around more often). 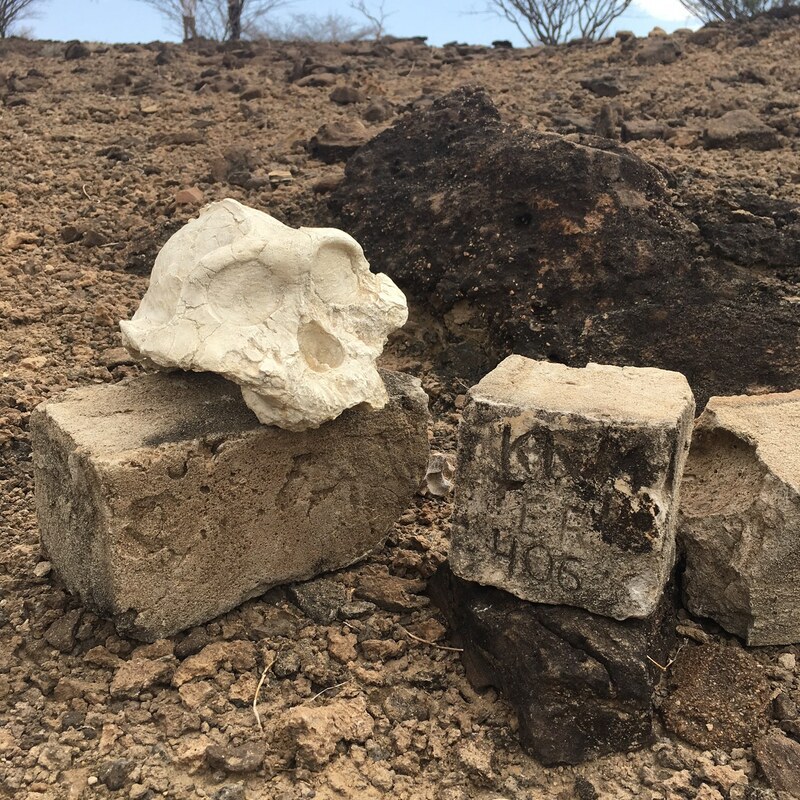 Sites in the Turkana Basin boast many important hominin discoveries, including Australopithecus anamensis (4.2 million years old), Australopithecus afarensis (about 3.3 million years old), Kenyanthropus platyops (3.5-3.2 million years old), Paranthropus aethiopicus (about 2.6 to 2.3 million years old), and Paranthropus boisei (about 2.3-2 million years old). While none of these hominins belong to our genus Homo, they tell a very interesting story of hominin evolution during a period of time when species diversity increased. It is likely that several of these species lived contemporaneously in the same regions, and so likely filled their own niche. Just after 3 million years ago we see the appearance of the earliest hominins that share our genus Homo in eastern Africa (finds in Ethiopia and Kenya provide the earliest examples). One of the most famous specimens found west of the Lake Turkana is a nearly complete juvenile skeleton of Homo erectus known commonly as the “Nariokotome Boy” skeleton (dating to about 1.6 million years ago). When it was discovered, it was the first nearly complete skeleton of this species. It provided a lot of important information about increasing efficiency in hominin bipedal locomotion, growth rates in juveniles, and overall information about changes in stature. Species of hominins in the Homo lineage continue to diversify and change from about 1 million to 300,000 years ago in ways that paleoanthropologists are still working to get a handle on. What does this species diversity mean? How much diversity is there within and between these species? How many species were there? We need more hominin fossil finds from this time period to really figure it all out. Finally, we see the emergence of Homo neanderthalensis in Eurasia (commonly known as “Neanderthal”) and then of our species, Homo sapiens between 300 – 200,000 years ago. Figuring out the number of species and the diversity within and between them takes a lot of analytical work. 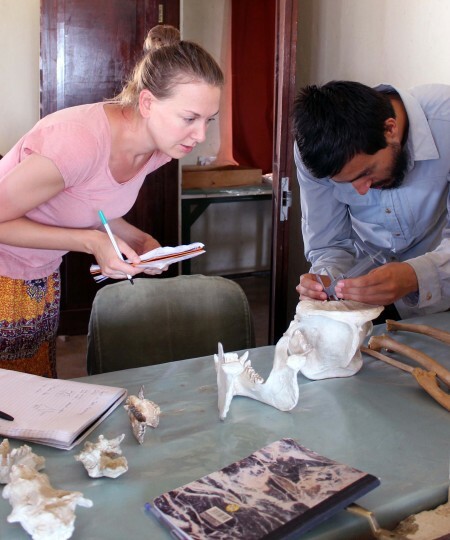 The TBI students tried their hand at comparing features of hominin crania and mandibles from all periods of human evolution. Their task was to describe the variation within certain features (e.g., cranial capacity or tooth shape and size) using casts. Dr. Mirazon Lahr watches as Jen and Max discuss their measurements for the assignment. 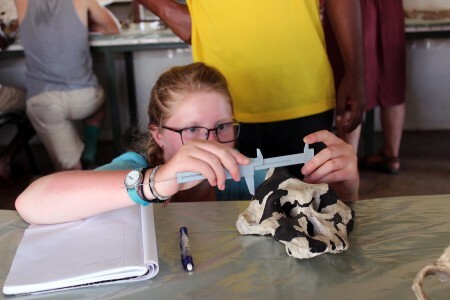 Maddie takes a careful measurement on the Paranthropus skull to later calculate cranial capacity. Evan assists Jen in taking a tricky measurement on this cast. Kait and Rob take down measurements from the casts to make comparisons among the specimens. 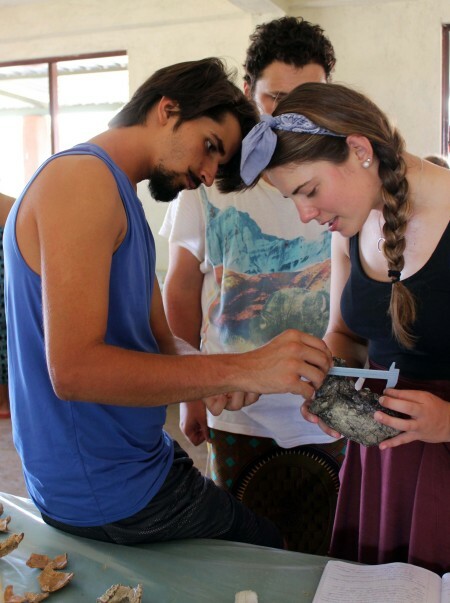 Milena and Ryan work together to complete their measurements on the casts. Max sketches a skull to get a better idea of its overall shape and structure. 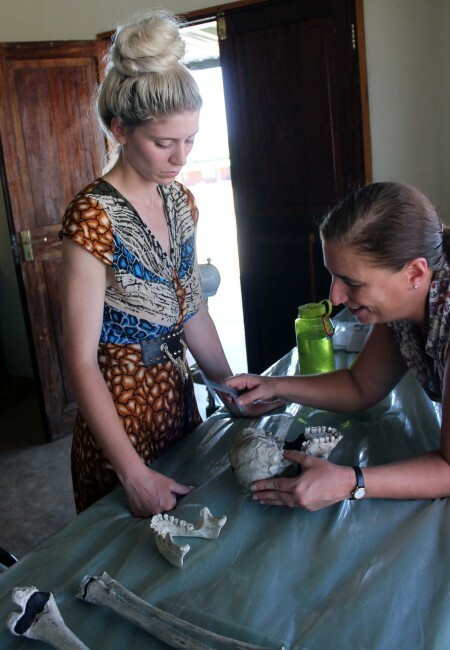 Dr. Mirazon Lahr assists Kait in taking measurements on the casts. The Homo sapiens is highly diverse today, and this is likely true well back into the past. 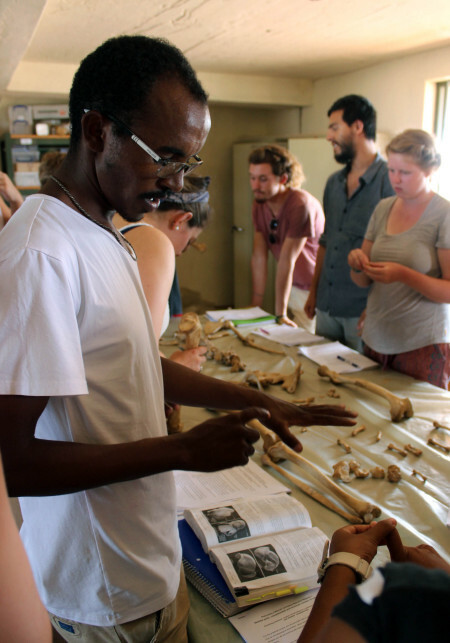 The students got a hands-on look at this diversity in more recent skeletons of humans from Turkana. 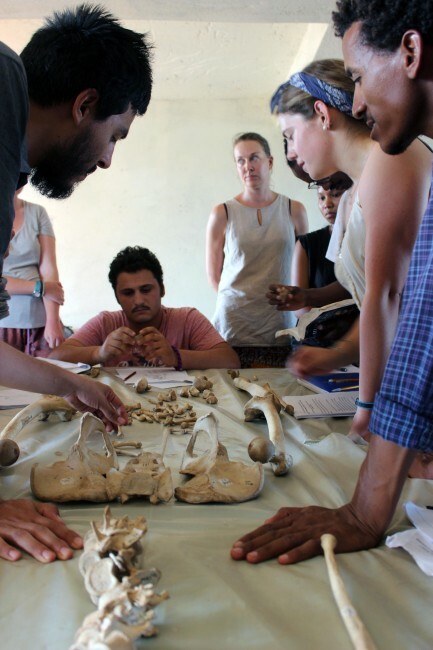 The students developed projects with research questions regarding stature, sexual dimorphism (visible differences in the bones of males and females), features developed by different muscle use on bones (muscle attachment sites), and variation in the size and shape of skulls and faces. The students developed their own research questions, methods, and interpretations. 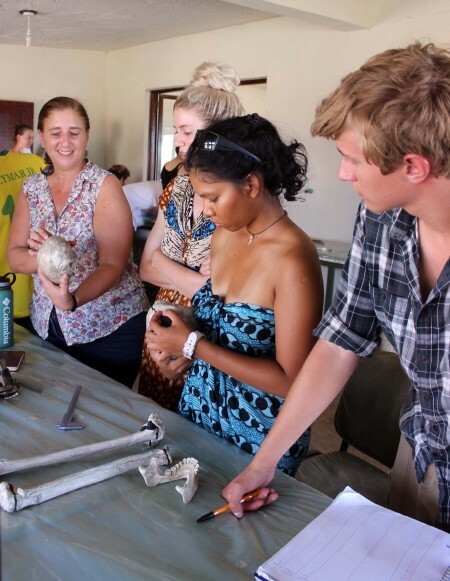 The project enabled students to develop key research skills in a hands-on setting. Maddie, Jen, and Adriadne work on their measurements for their group project on muscle attachment sites on the femur. 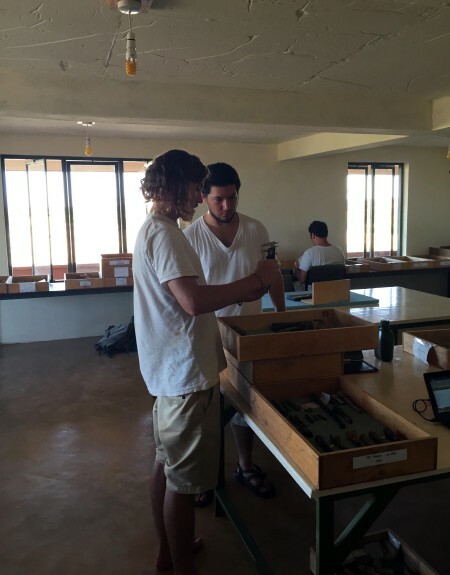 Joe and Jamie pull out their sample specimens to collect data about body mass and stature. 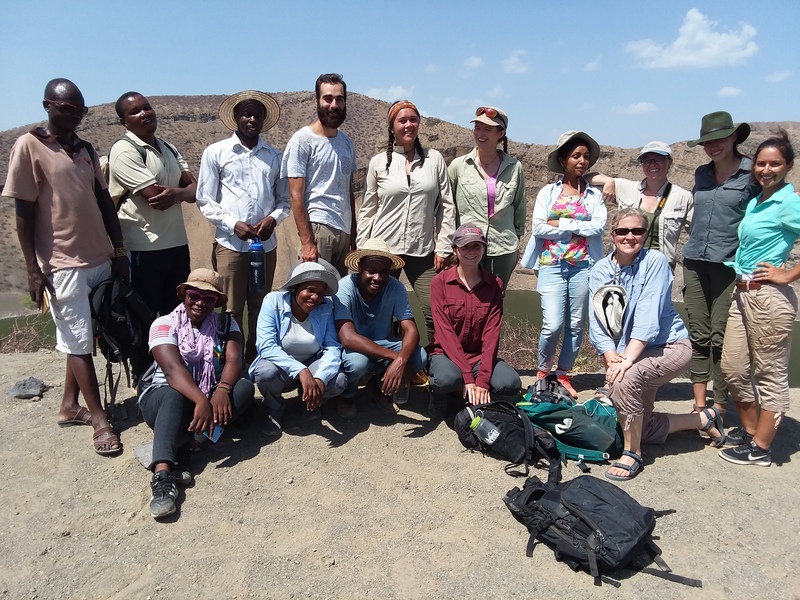 Finally the rains dried up and the students were fortunate to have a guided tour by Nyete (a TBI staff member who is an expert in fossil finding and collection) of some fossil hominin sites close by the Turkwel campus. 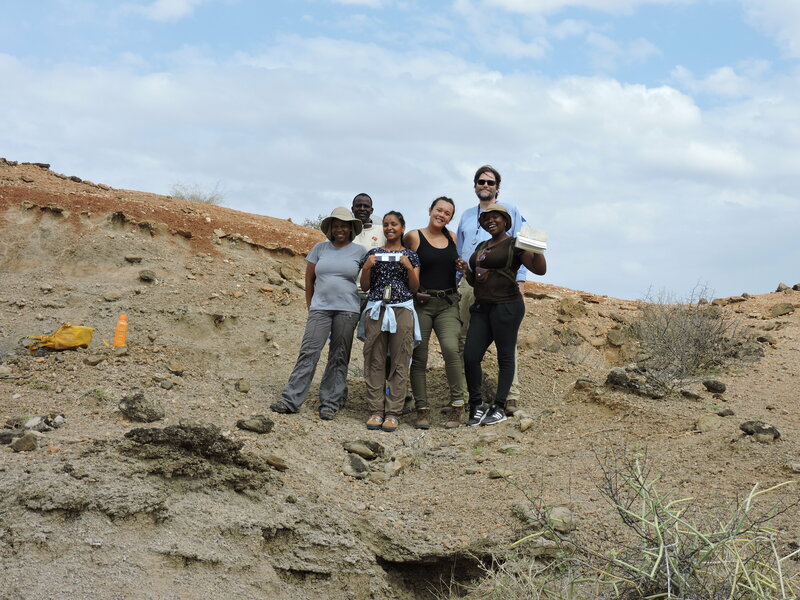 Night leads a team of Kenyan fossil finders, operating out of TBI facilities. The students heard first hand about the fossil finding process and visited a few of the sites. A day out in the field was much appreciated by all! 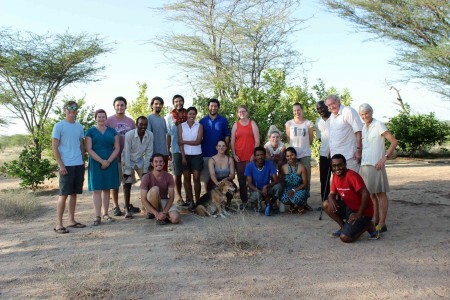 Lastly, the students received a special visit from Richard Leakey to round off their Human Evolution module. 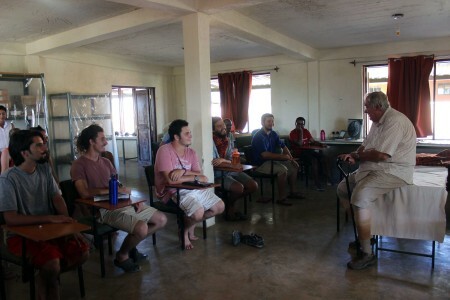 He spoke about Kenyan history, placing the science we’ve been learning about in context. The students enjoyed and were inspired by his many stories. This was an experience they will never forget!